This is an old gentleman’s residence in county down that had been in this family for some generations, after many years it was time for a refurbishment to meet this growing families needs and bring it in line with today’s modern way of living. 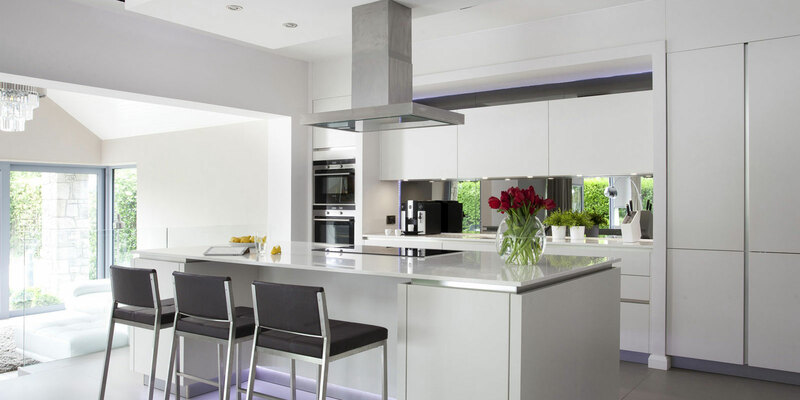 This kitchen area is part of the old home and part of a new extension, it was important to give a nod to the integrity of the home as well as to move forward with how this family wanted to live; they wanted a contemporary open space for kitchen living dining with full height doors and windows to acknowledge the beautiful garden in the summer months and also to get the best from the daylight. 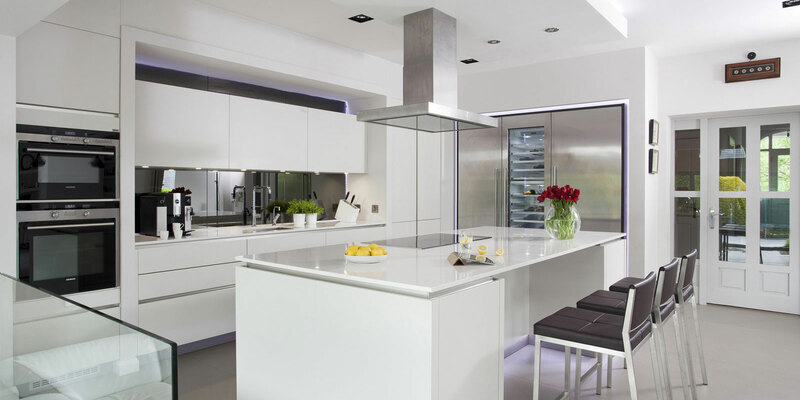 The kitchen is crystal white lacquer with terra oak panels, the design incorporates a breakfast bar dining option and 20mm Carrera Mist quartz worktops have been employed throughout. Lighting has been thought out carefully adding to the ambience of the room and removing the need for harsh overhead lighting. Led lighting frames the impressive Siemens A Cool refrigeration featuring a full height wine cooler. The bulk head mirrors the exact size of the island and features Led lighting in the shadow gap, behind the sink area a smokey mirror adds depth to the room and creates some interest while at the sink area. 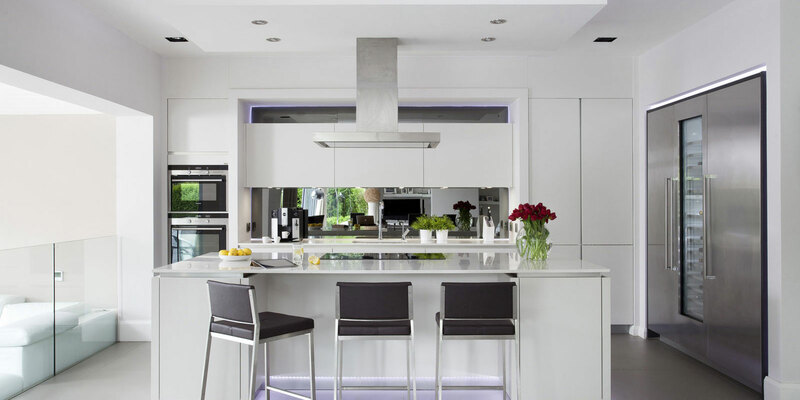 the rest of the living space compliments the kitchen in colours and textures and allows the space to blend together. 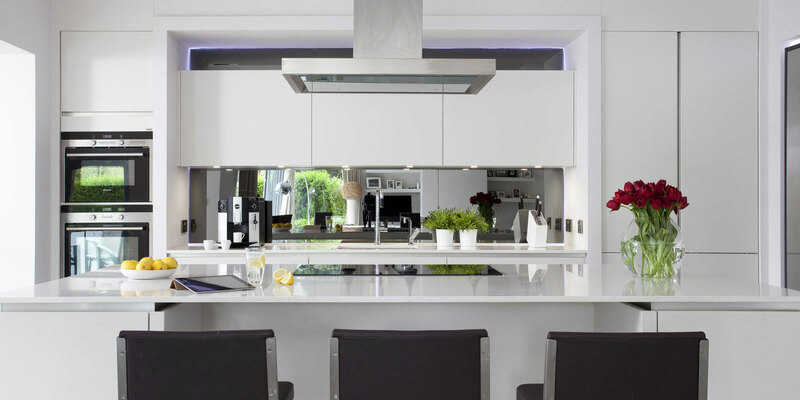 Siemens appliances are featured throughout and a quooker hot tap for instant boiling hot water, this is a fabulous home and has a kitchen with the wow factor!